Almost a year ago, Innovalia Metrology presented its laboratory in the AIC as an important part and unique structure within the development of the Basque industry. Since then, Innovalia Metrology has turned its AIC laboratory into a unique technological space that allows the group to do the training of the most important programs and masters in the metrological field. Innovalia Metrology thanks to its M3 technology has a space that offers the latest metrological technology; a laboratory with intelligent metrology solutions interconnected that allow a complete quality control from the fixation of a piece to the analysis of the production. 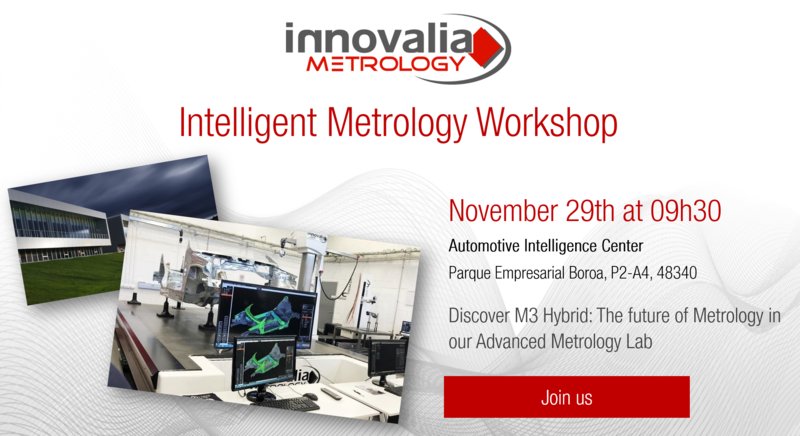 During the Metrology 4.0 Workshop Innovalia Metrology will present the technology behind its laboratory, but we will also see live, how is an intelligent, interconnected measuring process that optimizes any process. From intelligent verification processes to CMM Hybrid measurement with 3D sensor thanks to Optiscan, and a complete analysis that visualizes the status of our production at a glance. In addition, thanks to Redborder, Innovalia Metrology has installed in its laboratory a data management platform that has total control of the measurements, state of machinery and its general laboratory status that will be also presented to the attendees. In addition, Innovalia Metrology will give to the attendees information about its technology, and videos of real measurement cases. For those interested that won’t be part of the Workshop, Innovalia Metrology will share the experience with all of you via youtube. You will also be able to follow us and the Workshop through Twitter and Linkedin ¡Don’t miss a thing! Register here to be part of the event! Prev:Datapixel is focused on reaching a better-quality production through Zfact0r. Next:Metromeet announces the Conference Programme for its 15th Anniversary Edition!